Clean elegant Framed Border on Front Cover complements your work and Centers the insert Title page for a professional look. Easily insert preprinted Title Insert. Enhance Your Presentations. It's a relationship that transcends the images. The brand new Framed View SHP Advanced Hybrid ring binder elevates your printed inserts. Durable clear vinyl protects. There has always existed a formal relationship of Frame Styles to major European artistic movements. Let your best work escape the common generic white view binder. 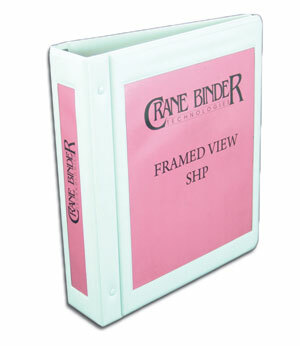 Crane Binder Technologies has introduced the most Durable View Binder. Secure Locking Binder Rings. The NEW SHP™ Framed View Binder with it's SMART LOCKING tm ring actually automates Retrieval/Insertion of text documents. See video ( SHPtm Binder Video) . This NEW Framed View SHPtm is a most Durable View Binder. New product based on prior art Swing Hinge Binder. Available Optional Blind Debossed Logo at all four Corners of Framed View further enhance your Presentation Binder. See example: AT&T, APPLE, ABC News, BBC, IBM, CNN, DHL, KFC, AIRBUS, VISA, WSJ. Unique SMART LOCKING™ Binder Rings hold 35% more working documents than AVERY AVE68050 or AVE68056.